Mountain bike rental from Nevis Cycles. 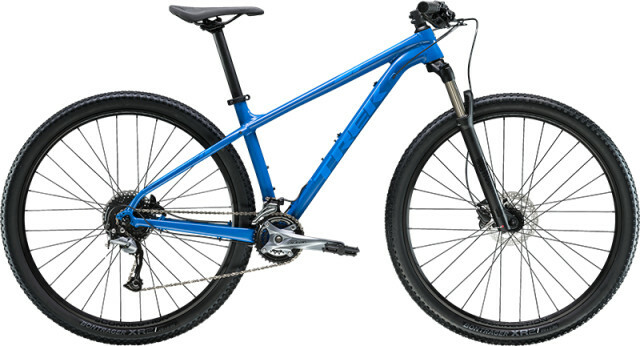 New Specialized or Trek bikes. These bikes are ideal for anything from the Witch's Trails to cycling Scotland coast-to-coast. For the Great Glen Way, this is our recommended bike. The powerful hydraulic brakes will prove their worth on the rocky paths and rough terrain further north, especially if you are travelling with pannier bags. The mainstay of our fleet for 2019 is the new Trek X-Caliber 7. Women's specific fit bikes are also available on request. Bikes are available at both our Nevis Range Witch's Trails hire shop and our Inverlochy, Fort William main shop. Helmets and tool kit are included with each bike. From £35 for one day with discounts for multiple days e.g. 1 week = £160.